The bones of the story are comfortingly familiar, the action is rollicking, and the metaphorical moustache-twirling of Alan Rickman's Sheriff of Nottingham is priceless. 143 min. Warner Brothers. Director: Kevin Reynolds. Cast: Kevin Costner, Morgan Freeman, Mary Elizabeth Mastrantonio, Christian Slater, Alan Rickman. 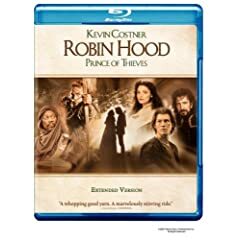 The 1991 blockbuster Robin Hood: Prince of Thieves does feel a bit like a movie created by throwing things at the screen and seeing what will stick. A lack of storytelling conviction keeps Kevin Reynolds' film far from high art and even sketchy as high-spirited entertainment, but it's "close enough for studio work." The bones of the story are comfortingly familiar, the action is rollicking, and the metaphorical moustache-twirling of Alan Rickman's Sheriff of Nottingham is priceless. 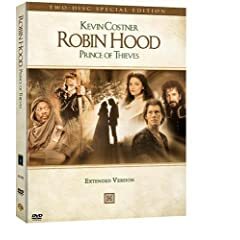 This is, of course, supposed to be Kevin Costner's movie: after all, he plays Robin of Locksley, the noble vigilante who comes to be known as Robin Hood. Costner plays him a bit like the Elliot Ness of the forest: stolid and moral but a bit dull. He's a planner who doesn't plan very well, blithely reckless instead of joyfully reckless. He's reliable in two respects: he's a deadshot with a bow and arrow, and he's willing to put his life on the line alongside (and in front of) the poor refugees he leads into battle. Next to Rickman's manic scenery chewing, though, the top-billed Costner seems to be on Xanax. Given the generic equivalent of the "St. Crispin's Day" speech from Henry V, Costner drawls it with something like urgency but a distinct lack of fire in the belly. Costner's natural, centered beach-bum zen also makes it difficult to spark with Maid Marian (Mary Elizabeth Mastrantonio), who must be slowly won over to his goodness rather than quickly exasperated by and infatuated with bad-boy charm. Costner's much-maligned accent is uneven, yes, but almost beside the point of a generally questionable casting choice. He gives a dutiful and sort of likeable performance; he's just not what we had in mind. And there's the rub: for those unwilling to banish memories of Errol Flynn and company, who set the standard in 1939's The Adventures of Robin Hood, Robin Hood: Prince of Thieves will perhaps seem like one disappointment after another. But credit Reynolds and screenwriters Pen Densham & John Watson for trying to do something different. Instead of sunny Technicolor swashbuckling, Prince of Thieves goes for a murkier, dirtier feel impressively shot on location in the countrysides and castles of Britain and France. The picture opens in—of all places—Jerusalem 1194 A.D., at the tail end of Richard the Lionheart's third Great Crusade. There, Robin narrowly escapes mutilation, in the process saving the life of Moor and Muslim Azeem Edin Bashir Al Bakir (Morgan Freeman). Azeem pledges his life to Robin's service, at least until the favor can be definitively repaid. When Robin returns to Nottingham, he finds that the Sheriff and his cousin , Guy of Gisbourne (Michael Wincott), have made a power grab in the king's absence. Robin's father Lord Locksley (the incomparable Brian Blessed) is dead, and the Merry Men are a little worse for wear: many peasants have taken to hiding out in Sherwood Forest to horde what little resources they have before the Sheriff and his men can claim them. Robin proves his mettle in the traditional riverbed exhibition match between him and John Little, a.k.a. Little John (Nick Brimble). Will Scarlet (Christian Slater)—in this version a young punk harboring a secret hurt—isn't won over so easily. Maid Marian is also coy about where her loyalties lie, though she swiftly proves she's a more than capable fighter. This fact does her little good in the climactic clutches of the Sheriff, who schemes a broadsword wedding to improve his royal credentials (Marian, you see, is the king's cousin). Densham & Watson throw in a supposed witch named Mortianna, family secrets revealed in the third act, and plenty of ripe dialogue for Rickman, who tosses it off so well you'd swear he was ad-libbing it all. Fed up with Robin's guerilla success, the Sheriff sneers, "Cancel the kitchen scraps for lepers and orphans. No more merciful beheadings. And call off christmas." What else? Micheal Mcshane (Whose Line Is It Anyway?) makes a good impression as the liquor-loving Friar Tuck. Reynolds innovated the arrow P.O.V. shot, which is something, I guess. Michael Kamen's rah-rah score proved influential, launching a thousand sportscasts. And the film ends with one of the all-time most surgically precise cameos, bringing in a big star (and former Robin Hood) to play the returning King Richard. Robin Hood: Prince of Thieves is hardly ever that precise, but maybe that's for the better: it has enough shaggy charm to get by. Warner ports over its best-selling Two-Disc Special Edition of Robin Hood: Prince of Thieves to Blu-ray for the title's next-gen debut. This means the film is presented in its "Extended Version," with approximately twelve more minutes of footage than were seen in the theatrical version. The picture quality is uneven, though I would chalk up some of that to a problematic source. This movie has always looked a bit muddy and dim and rough, even in theaters. Still, the transfer overcompensates with DNR that rubs out some detail in an attempt to calm the film grain. Despite such flaws and bouts of digital noise here and there, this transfer still qualifies as an overall upgrade in picture quality—whether it's enough for a double-dip will be up to consumers, but first-time adopters shouldn't hesitate. In the sound department, the Dolby TrueHD 5.1 surround mix steps things up. The channels are distributed effectively to put us in the middle of battles with schwing-ing, clanking swords and whizzing, thunking arrows. All of the key bonus features have been preserved on Blu-ray, beginning with a commentary by Kevin Costner and director Kevin Reynolds. It's a good opportunity not only to get a sense of the film's behind-the-scenes challenges, but also to dissect a team that has weathered rumors of dysfunction and rifts. There's also a commentary by Morgan Freeman, Christian Slater, and producers/screenwriters Pen Densham and John Watson that gathers their perspectives on the film's making and, more particularly, what guided the screenwriters' approach. "Robin Hood: The Myth, The Man, The Movie" (31:52, SD), hosted by Pierce Brosnan, does an admirable job of explaining the legend (for that would seem to be the more accurate word) of Robin Hood, joined to standard making-of material about Prince of Thieves. Participants include Costner, Mary Elizabeth Mastrantonio, Reynolds, retired Cambridge professor Sir James Holt, author Graham Black, education officer John Charlesworth, Robin Hood "relative" David Lemm, "Sheriff of Nottingham" Alfred Stone, Robin Hood folklore authority Jim Lees, author Rudy Behlmer, Freeman, Watson, costume designer John Bloomfield, composer Michael Kamen, Densham, Alan Rickman, Slater, stunt coordinator Paul Weston, and Micheal McShane. "One-on-One with the Cast" (19:29 with "Play All" option, SD) presents EPK interviews with Costner, Freeman, Mastrantonio, Slater and Rickman. "Trailers" (4:18 with "Play All" option, SD) include the Theatrical Trailer and six TV Spots. "(Everything I Do) I Do It for You" (4:17, SD) is a live performance by Brian Adams at Ireland's Slane Castle. All site content © 2000-2019 Peter Canavese. Page generated at 04/18/2019 02:52:36AM.